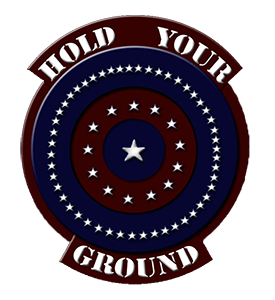 The Hold Your Ground(TM) Logo represents a philosophy. We all have things in our lives that we believe. Whether you are a conservative, right wing, Republican, or a liberal, left wing, Democrat, you have your own ideas on how the world works, and your place within it. 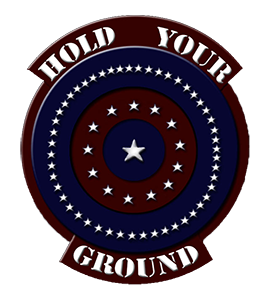 Each of the components in the Hold Your Ground badge represents the way that those ideas can work together, just like us, to become a stronger person, a stronger country, built on the ideals we were originally founded on. There are fifty stars in the outside ring, one for each of the fifty states. They stand strong on their own, with their own values, their own ideas, and their own identity. They represent our individuality, our individual strength and ideas, our ability to thrive on our own. No matter what the rest do, we are strong, and will survive with our own inner fortitude. The inner ring contains thirteen stars, one for each of the thirteen, original colonies. It is our history, where we came from, what we used to be, and how we came to be who we are. We always have things in our past that shape us. Some of them are for the better, great experiences that mold our minds and our outlook on the future. They instill us with hope, encourage us to fly. Others, are difficult. Negative experiences teach us that the world can hurt, that it can knock us down and beat us until we are bleeding. It can make us bitter, angry, it can teach us to crawl, or cower in the corner. Either way, where we came from is important in determining who we are, and who we could be. The center star is arguably the most important. It represents the number one. One people, one country, one goal. While we are all individuals, we are all strong and capable and can make it on our own if we need to, we are designed to come together. We are driven by our history to better ourselves and make a better life for us, and our children. With all of that said, we are the same. Black, white, red, or green, we are all human. We all want the same things, and we can achieve them, together. The belief, the idea that Hold Your Ground stands on, is to never compromise for the sake of ease. We can fight together as a people to keep our country going in the direction that we want. Not the direction that is handed down from above. If you believe in something strongly, educate yourself about it, and then stand strong behind that belief. People will try to change you, the world will try to push you over your moral lines. And, when it does, it is up to you to never compromise. It is your job to never budge. The more the world throws at you, the more it tries to beat you down, it is up to you to Hold Your Ground.